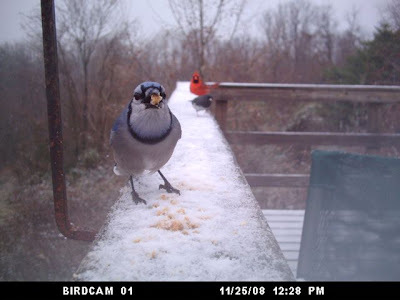 Here are a few of my favorite bird pix from the first half of 2008. Wishing you and yours a happy, healthy, prosperous, peaceful new year. Diademed tanager from Brazil—maybe my fave bird I got to photograph during 2008. Chukar in Utah—my only North American lifer in 2008. Atlantic puffin, Hog Island, Maine in June. Male blue dacnis, Brazil in July. Male Baltimore oriole, South Padre Island, Texas in April. Male Cape May warbler, South Padre Island, Texas, April. Sky full of snow geese, Kearney, Nebraska in March. Ocellated turkey, Tikal, Guatemala, March. Collared aracari, Tikal, Guatemala, March. Highlights of 2008: Got Milk? According to my sources, fluent in Portuguese, this sign says "Milk from the foot of the cow." In Brazil, while driving along any main highway, you might chance upon a roadside restaurant and store called Vaca Preta, which translates from the Portuguese meaning Black Cow. What makes the Black Cow different from, say a Steak-N-Shake in the United States, or a Happy Eater in the United Kingdom is that the Black Cow has a cow (not always black) in a pen in front of it. For a small fee, you can have the farmer on duty squeeze you off a glass of milk while you wait. He'll even flavor it for you, if straight, still-warm-from-being-inside-the-cow, milk is not your thing. We were stopping at Vaca Preta for lunch on our last day of a birding trip throughout southeastern Brazil. The restaurant inside was famous for its sausage sandwiches (not beef burgers??) and our guide, Paulo Boute, had been extolling their virtue all morning long. So we decided to eat first and watch the cow-milking action later. Inside was a fire pit, smoking and sizzling, where they cooked the sausages, onions, bread, and melted the cheese for the sandwiches. This was a good sign. My heart always sinks when I walk into a roadside eatery, ravenous from a day of birding, only to find frozen burritos, pre-made sandwiches, and a microwave. This place was cooking real stuff on an actual fire—caveman style. The fire pit at Vaca Preta. The lunch was great and the sausage sandwich especially yummy and bad for you (as yummy things usually are). One of the famous sausage sandwiches. Yes, they were really good. DO NOT DRINK unpasteurized milk from Vaca Preta. So, alas, I did not sample this South American delicacy. However I DID manage to make a short video of the experience to share with you. Here is the cow in her pen. She seemed content and had a lot of food and water, plus a compassionate milk squeezer. And here is the aforementioned milker and milkee, shooting the frothy white milk right into Paulo's cup. Enjoy! "This goose is no more! He has ceased to be! If you hadn't nailed 'im to the perch, 'e'd be pushing up daisies! This is an EX-GOOSE!" "Can I exchange this here? I requested a Cackling Goose." Both of these entries (and several others) were sent in by KatDoc, who blogs here. Also in the final round of chuckling were captions sent in by: Natural Moments, HoaryRedpoll, Jomo, and Kevbosnafu. But ALL of the entries were clever and I thank you for taking time from your holidays to play this kooky game here at Bill of the Birds. While waiting for the imaginary holiday being of your belief set to come down the chimney/appear on the mountaintop/emerge from the old lamp I thought you might like a birding brain teaser. I photographed this bird at Florida's Ding Darling National Wildlife Refuge in February a few years ago. Can you tell me what it is? And no, its not Phyllis Diller's wig resting on two chopsticks. 1. It's a short, holiday-filled week. 2. I have a pressing deadline. 3. The last BOTB caption contest was so much fun. 4. Holidays and a goose naturally go together. 5. I could NOT hide this amazing photo of Ohio birding icon Jim McCormac any longer. Share your creative and funny caption with the rest of us via the Comments option below. The deadline for entries is 6 pm on Christmas Day (that's Thursday, December 25, FYI). I will announce a winner on Boxing Day (Friday, December 26, 2008). 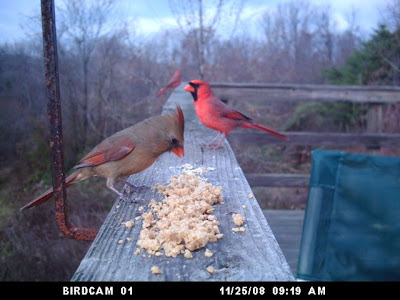 The winner gets a year's subscription to Santa's favorite birding magazine, Bird Watcher's Digest. p.s. That's a barnacle goose (the one with the black neck). Winning Caption #1: Why should bowlers be the only ones with cool shoes? Winning Caption #2: This is so Prez Bush can see them coming! 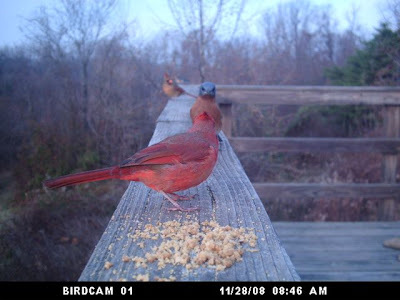 Congratulations to Virginia's own Alan Pulley, keeper of the Birds 'N Such blog, for his TWO winning entries! Alan will receive a year's subscription to Bird Watcher's Digest as well as everlasting notoriety as the winner of this Bill of the Birds Photo Caption Contest. A special thank you to all who entered. Choosing one winner was really tough. Also finishing in the top 5 were the following players: MikeMcD, jdr, OpposableChums, jomo, and Dubs. You can find their entries, along with all of the other captions submitted at this link. Tune in next week for another round of caption-writing zaniness. Last April, due to a problem with the FTP servers at Blogger, I was forced to find a new home for Bill of the Birds. I was unable to post via FTP (file transfer protocol) so that I could host my blog on the Bird Watcher's Digest site. So I moved over to Blogspot. Well, we could never really figure out what the problem was, but, as with many things in the digital realm, it now seems, mysteriously, to be resolved (actual digits of fingers crossed). So I am going to move back into the old place with Blogger. Please bear with me as I try out this new/old way of doing things. If it works, I'll be happy. If it does not work, I'll spend a lot of time mumbling other (less polite) versions of what FTP might stand for. Please add this to your bookmarks, if that's how you access BOTB. If you access via RSS (Really Simple Syndication) the new address should be picked up automatically. or add a comment here and I'll see if I can help you out. Many, many thanks for your patience and sorry for any inconvenience. I truly appreciate your interest and support. Special thanks to Katherine K., my Wonderful Web Witch. 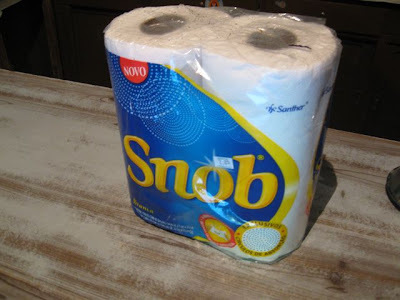 My birding pal Terry Moore and I found these paper towels in a roadside store in Brazil last summer. We couldn't resist taking a photo and I tried to ask the store owner if they had the same brand, but in toilet paper. He did not really understand what I was saying (my Portuguese being on-existent) or why we were laughing ourselves silly over some stupid paper towels. Birding in foreign lands is fabulous. But even better are some of the funny product names you encounter. Northern cardinal male. We have one less of these on the farm this morning. First thing this morning, while I was talking on the telephone with a hick buddy from West Virginny, the death rocket came blasting past the studio window. This was a big female sharp-shinned hawk and she swooped up into feet-forward position to grab a male northern cardinal. Her piercing talons must have killed the redbird instantly because he hung limp as she pumped her wings and propelled the two of them into the sumac thicket. Entering the thicket at full speed, she turned just so, and did not disturb a single snowflake from the branches as she passed. The entire event took less than three seconds. The sharpie was in blurry, fluid motion the entire time. Many of the birds at the feeders next to the birch tree were so surprised that they did not have time to react. And in the aftermath, no one dared visit the feeders for half an hour, despite the ice and snow covering everything. 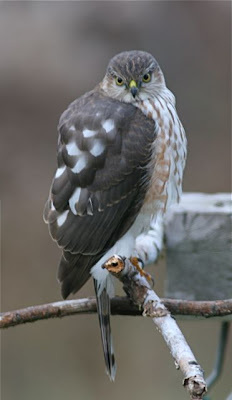 Sharp-shinned hawk at our feeders last spring. I am inviting all Bill of the Birds readers to write a funny caption for this photograph. I took this image in November on a birding field trip to The King Ranch in southern Texas. Please submit your entry via the Comments posting option below. I will select a winner on Friday, December 19, 2008. Employees of BWD and members of my immediate family are only eligible if they submit their captions in person, written in Sharpie on the back of a $50 bill. The winner will get a free one-year subscription to Bird Watcher's Digest (that's a $20 value!) for themselves, or to use as a gift for a fellow birder. Comments by Anonymous will have a hard time collecting the prize. This Birding Life: New Episode! Episode #18 of my podcast, This Birding Life, is now available for your listening and viewing pleasure. The new episode is titled "Phoebe and the Young Birder's Guide." As with most episodes of TBL, this one comes in both enhanced audio M4a format (with images) and in regular MP3 (audio only) format. You can listen/watch on your computer, on your MP3 player, iPod, iPhone, or anything else that plays digital files. This does not include that new Close N'Play record player that Santa is bringing you in a few days. 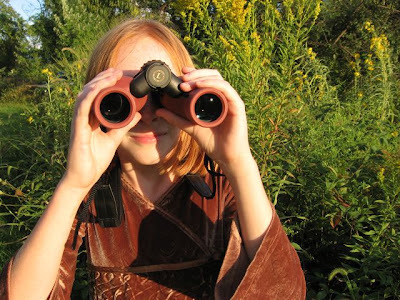 In this latest episode, I interview Phoebe Thompson, age 12, my primary co-author (with her 20 or so classmates) on The Young Birder's Guide to Birds of Eastern North America. Phoebe and I talk about how the book came to be, about the perception of bird watchers among her peers, and about her life in a family of birders. I happen to think Phoebe did a great job in the interview, but then again, I might be biased since Phoebe is also my daughter. I'm hoping listeners will forgive this bit of nepotism. And I'm also hoping that all of us bird people will do what we can to "pay it forward" by sharing the world of birds with a young person. I've written before about Nature Deficit Disorder here in Bill of the Birds. It's a very real concern. Why not ask an interested youngster along on your next field trip, Christmas Bird Count, or to a bird club meeting? We all need to contribute to get kids interested in some aspect of the natural world. I happen to think that birds are the very best way to accomplish this. 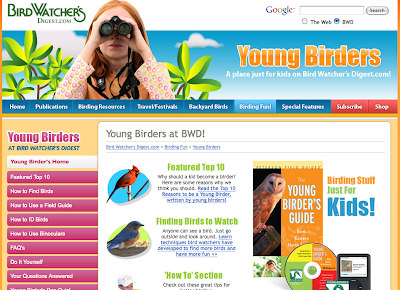 For young birders surfing the Web, the newly redesigned "Young Birders" section of the Bird Watcher's Digest website has some great content, a bird quiz, tips for better bird watching, and more. The section also includes information about the new booklet we've just created Bird Watching For Kids! I'll write more about this booklet in a future post here at BOTB. Special thanks to Houghton Mifflin Harcourt Publishing Company for their sponsorship of This Birding Life. An adult female yellow-bellied sapsucker showed up at the peanut feeder today. Zick had noticed that the peanut consumption was way up and the peanuts in the feeder were way down, and wondered why—even going so far as to wonder specifically about a sapsucker. I think she may have even conjured this bird. 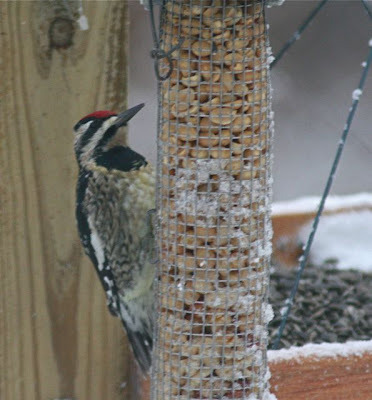 It's been years since we've had a sapsucker at the feeders regularly. I'm hoping this gal stays for a spell. We've got lots of peanuts on hand—she can eat all she wants. Highlights of 2008: Birthday Lifer! Bat falcon, Flores, Guatemala. March 3, 2008. My pal Jeff Bouton knew this and made it his special quest to add this bird to my list. 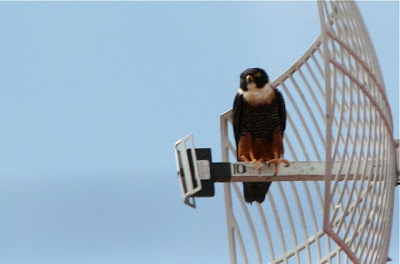 He succeeded in high style, scoring me a Falco rufigularis on my actual birthday, last March 3rd. I told this tale here in the pages of Bill of the Birds last March. JB shared his version of the event on his blog, The Leica Birding Blog. 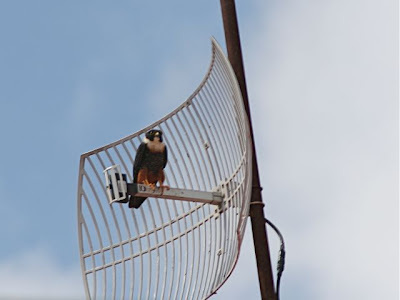 The birthday bat falcon in Flores. It was a very patient bird. The bat falcon, and being surrounded by friends and loved ones, made my birthday in 2008 a Happy Bird Day. Gallo and life birds—they just seem to go together. I believe there was also some beer and ice cream involved, though not at exactly the same time. I get an ice cream assist while photographing the b-day bat falcon. Image by Jeff Bouton. *The automatic URL pointer for this Blogspot version of Bill of the Birds went slightly haywire yesterday morning, so some of you may have been mistakenly redirected to the old Blogger BOTB. If that happened, sorry about that. You might want to fix your bookmark by copying the URL of this version. Or just sign up for the RSS feed and brace yourself for a daily helping of BOTB with a side of flies. Perhaps this is a sign that birding or bird watching has finally come of age. We're starting to see films being made about our hobby. And, the good news is, these films do not star Miss Jane Hathaway, Professor Pith-Helmet, or that crotchety old lady ornithologist from The Birds. 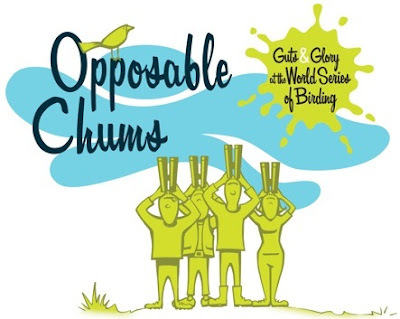 Enter: Opposable Chums: Guts & Glory at the World Series of Birding. Jason Kessler, fortunately, is one of us. He's a birder, too (and a rock musician, but that's a subject for another day). He set out to try to capture the essence of competitive birding by filming the participants in the grand-daddy of all North American birding competitions, the World Series of Birding. I've watched the film through a couple of times now and am very impressed with its scope, with its fair treatment, and with its good humor. It lets the characters interviewed for the film be themselves. 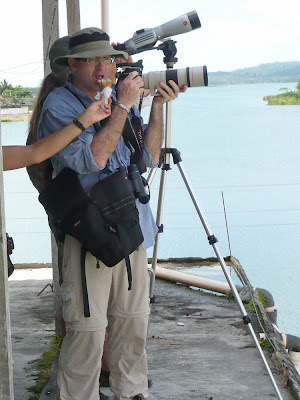 Kessler does not stoop to the tired clichés about birding, nor does he fall under the spell of the event or its main players. He gives us an unvarnished look at several of the teams participating in the WSB, including some of the teams with no chance of winning, and the personalities associated with them. This is particularly refreshing because it helps to give a sense of why otherwise (mostly) normal people would subject themselves to 24 hours of birding. 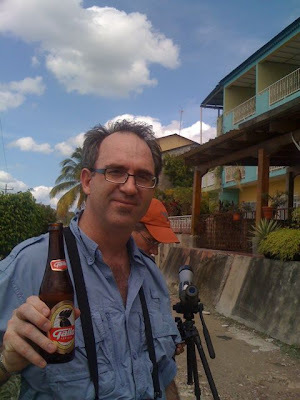 Veterans of the birding scene will recognize many of the famous talking heads in Opposable Chums, including David Sibley, Kenn Kaufman, John Fitzpatrick, and Pete Dunne. The film also features some equally good birders with less of a Q-factor including Connecticut's Frank Gallo, The Cornell Lab's Kevin McGowan, and New Jersey's own Pat Sutton. The camera work and editing in Opposable Chums is fantastic. Nothing kills a documentary film faster than a series of headshots of talking heads. Kessler avoids this pitfall with clever shooting and even more clever editing to keep the story moving when things aren't that visually exciting. There are even some scenes shot with dashboard-mounted cameras that reminded me of "Taxicab Confessions" from HBO. 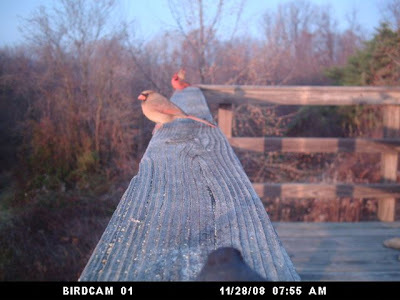 Birding as reality television. One small quibble, though not with the film. 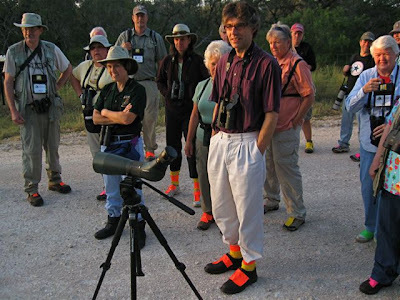 We birders need to get a hobby-wide eyeglasses makeover. I think the last time I saw this many over-sized eyeglass frames was in an Elton John concert on VH1. Seriously, folks. Call your eye doc and make the appointment! I won't give away all the details of Jason Kessler's film. It's a great take on competitive birding and a peek into the hearts and minds of some truly avid birders. It's entertaining enough to amuse non-birders, but unlike so many media depictions of our hobby/sport, this one won't make you cringe. It pokes fun, but does so lovingly. You can view trailers on the film's website, and you can also order your very own copy. I'll bet you'll watch it more than once. I did! As the end of another year draws nigh, I am beset and bemused by thoughts of the year's highlights. 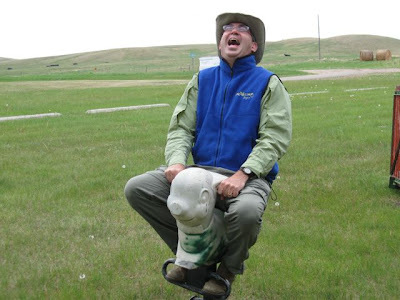 One of the first highlights to come to mind for 2008—and for many of the past six years for that matter—was my annual ride on the Pale Playground Pig of the Prairie. Located in a small lakeside playground not far from Carrington, North Dakota, the pig is one of those timeless kids' rides: a cartoonish animal attached to a giant spring mounted in cement in the ground. Every time I make the pilgrimage to see it, I am amazed at its longevity. It probably gets covered in feet of snow each winter and chilled by howling, sub-zero Alberta Clipper winds, then baked by the prairie sun each summer. And though it's a bit paler each time I see it, it's always smiling. When I'm lucky enough to be a leader on the Arrowwood NWR birding field trip at the annual Potholes & Prairie Birding Festival held each June in central North Dakota, I look forward to getting in a little quality riding time with the PPPP. We always stop at the park because it has public restrooms, which are near the top of the must-have list for any birding trip (just below a thermos of bad coffee and a bag of waxy chocolate donuts). The park also has breeding least flycatchers, western kingbirds, both orchard and Baltimore orioles, and tons of warbling vireos. The Potholes & Prairie Birding Festival is the very essence of quality over quantity, which is one of the reasons we've done the event for many years running. Other festivals may get more attendees, but few offer more birds, or nicer people. If you're interested, visit the festival's website and see for yourself. Who knows, may YOU'LL get to ride the Pale Playground Pig of the Prairie in 2009. If you come to the festival, I give you directions right to it. I'll share some other highlights from 2008 as they come to mind. In the meantime, please share a few of yours! I took this photograph of a magnificent frigatebird in Panama in October, but it reminded me of a conversation I had with a fisherman years earlier, while looking at another frigatebird. This was on the Sanibel Island causeway in Florida. It was frozen icy winter in Ohio, where I'd just come from. I was less than an hour off the airplane, driving my size-of-a-rollerskate rental car out to Ding Darling NWR, when I decided to stop along the sandy road shoulder to glass a few Florida birds. Brown peilican: nice! Dozens of winter-plumaged willets: sweet! Hey! Sanderlings! Right on! A few steps closer to the water was the ubiquitous broken picket line of retirees fishing. I smiled and nodded at a rotund man smoking a stogie while he removed some plant material from his fishing lure. He moved with the slowness of someone who has all the time in the world. I was envious. Just then the shadow of a bird passed over our heads. I looked up into the blinding sunlight just long enough to catch a glimpse of a magnificent frigatebird scything low over the palm trees and out across the inlet. 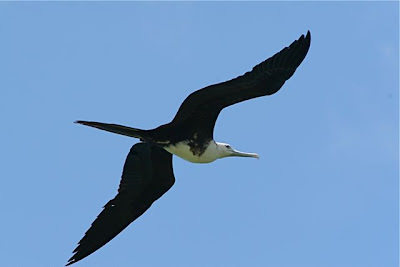 "Nice frigatebird!" I said to no one in particular. "Yeah, that IS a nice friggin' bird!" came the reply from the porcine pescador. We shared a smile and a thumbs up. I headed back to my ride, laughing quietly. Birders. There's a new one born every minute. Snowflake at the suet dough in February 2008. Some of you might remember my posts last winter about Snowflake the leucistic adult female dark-eyed junco who was a winterlong visitor in our yard. Well, Snowflake did not show up in October, when the first returning juncos did. 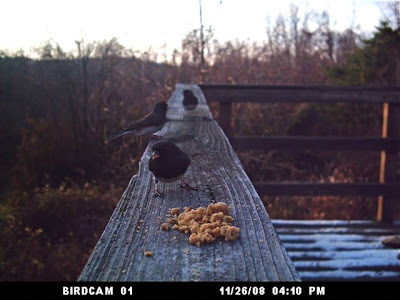 And now, it's December and we've got at least 30 dark-eyed juncos scattered around the various feeders and fields—but all of them have normal-looking plumage. Which makes me wonder what happened to Snowflake. Did she make it through the spring and summer and now is spending this winter somewhere else?Did a sharp-shinned hawk get her? A house cat? Did she collide with a radio tower? Did she die of natural causes?—most passerines are lucky to survive more than just two years. Or is she just not back here yet? I'm hoping it's the last one on that list. Dark-eyed juncos are considered short-distance migrants. The distance between their boreal forest breeding range and their wintering range pales in comparison to the migration of a blackpoll warbler, which also breeds in the boreal forest but migrates to South America. 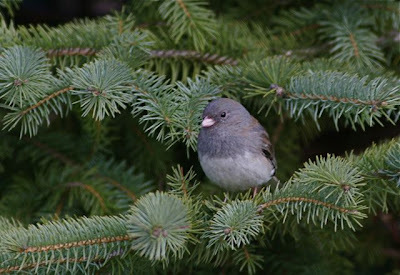 Most juncos spend the winter within the United States and Canada. 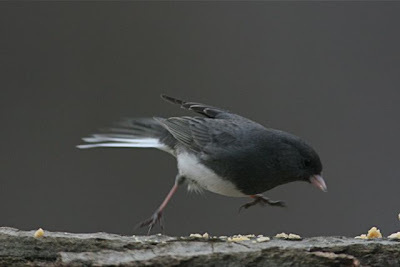 Some juncos, such as those that I see in the West Virginia mountains each spring, don't migrate at all. We've got plenty of "normal" juncos around this winter. We could always tell Snowflake because she looked more like a snow bunting than a junco. She was a perfect "marker bird"—a bird with an obvious and unique physical character that allows you to identify it as an individual. Otherwise, most individual birds of a single species are hard to tell apart, unless you get a really close look and spend some time looking for subtle differences. Snowflake looked like a snow bunting at first glance. Bird banders love to tell stories about trapping ruby-throated hummingbirds or chickadees at a feeding station. They'll catch a dozen birds and band them, but still more unbanded birds keep showing up. It's pretty amazing when you realize just how many individual birds of a single species might be visiting your feeding station, bird bath, or garden. 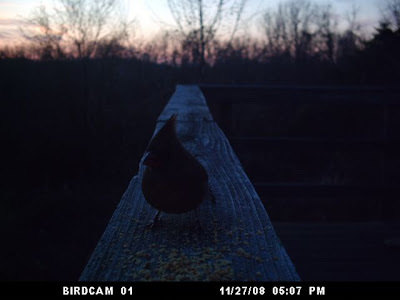 You might THINK that that is Mr. Reddy the cardinal who always shows up right after dawn on the hopper feeder. But it may only be one out of 17 different Mr. Reddys that come for an early meal. Marker birds allow you to be sure you are seeing the same individual bird. Last winter I was home a lot finishing up a book project, so I got to know Snowflake's routine. In the morning she was in the weedy edge along the orchard. In late afternoon she'd come to the deck railing around back for some suet dough. At night she roosted in the brambles along the spring trail, down the hill behind our house. Sitting here at my desk today, watching the snow dance down, I can see a small pod of juncos kicking through the mixed seed under the pines. I'd like to look out and see a mostly white one for the third winter in a row. Guess I'll keep watching and hoping. In March of 1964, I was a two-year old kid sitting in a highchair at the window of my grandma Thompson's kitchen. It was a snowy morning on the farm and the feeders were mobbed with birds. This is the moment I called out my fist bird ID (according to Grandma Thompson). "Junco!" I said, pointing out the window at the bird feeder. Gram swore that was my exact word—practically my first one! Of course it was not until 1968 or so that I met my spark bird. If you've got a spark bird story to tell, why not share it with your fellow bird watchers via The Spark Bird Blog? We'd love to add your story to the collection. To submit your spark bird story, send it via e-mail to sparkblog AT birdwatchersdigest.com. And speaking of bird names: The bird pictured above might better be called a dark-eyed jumpo, don't you think? This junco was photographed recently from the kitchen window of MY farm, about 15 miles from where the old family farm was, here in southeastern Ohio. With all the bad news we get bombarded with on a daily basis, it's good to know that some things never change. In winter, at least here in the Appalachian hills, when the snow flies there will always be juncos. 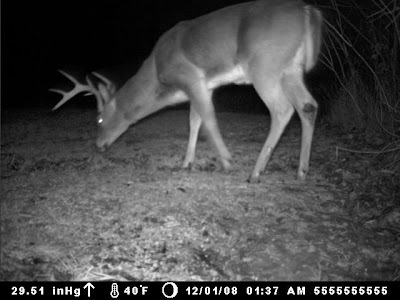 I put the Moultrie GameCam out by the inedible pear tree last Saturday night, November 29, 2008. In front of the camera I scattered inedible pears from said tree and some cracked corn. I let the camera grab images for the next couple of days but the most activity occurred on November 29th, coincidentally the night all the food was put out. The video slide show I put together captures the sheer volume of action that happens at a food source at night, while we humans are sleeping. We can occupy these same spaces during the daylight hours, completely oblivious to what went on in that exact spot the night before. We might notice that the amount of food is reduced or that there's some additional animal poop on the ground. But we don't really KNOW what went on there until we get to see the images recorded by one of these handy, remote, motion-sensing cameras. I believe I got images of seven animal species in this single 24-hour period: eastern cottontail rabbit, white-tailed deer, gray squirrel, northern cardinal, Boston terrier, Homo sapiens, and Virginia opossum. Just after midnight on the 30th of November, two more species walked in front of the camera: a feral house cat and a raccoon. But they were too slow to make this slideshow of all the visitors on the 29th. When watching the video, you can note the time at which each image was taken in the black band across the bottom, along with the outside temperature, moon phase, and barometric pressure. This is pretty fascinating stuff—at least to me. Thanks to the Magic option in GarageBand for the help with the country-fried soundtrack. Shotgun season for deer hunting started at dawn yesterday. Here in the boonies of southeastern Ohio that means woodlands dotted with blaze orange and a regular tattoo of gunshots throughout the day. Our part of the state swells in population with the addition of thousands of hunters coming down to Ohio's most deer-rich corner. We have huge chunks of Wayne National Forest here as well as big parcels of state game land, recovered strip mine acreage, and private hunting areas. This time of year it's wise for everyone to wear blaze orange. I don't hunt myself, but I have to follow the hunting season fairly closely. As someone who likes to walk in the woods—80 acres of which I own—I can't go out during the next two weeks without wearing blaze orange. Each year our local news carries reports of accidental shootings of deer hunters. It's not worth risking an accident. Even though my land is well posted with No Hunting and No Trespassing signs, I know that I've had hunters taking deer—or at least stalking them—on my land most years. 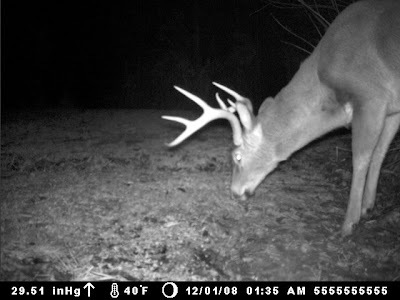 The worst was about five years ago, when, a week after deer season was over, I found a huge buck dead in my east valley, in the bed of the stream. His antlers had been sawed off and the carcass left to rot in the water. I made a sign labeling this as the site of a poaching with an invitation for the hunter to come clean by calling me. Never heard a peep. Just like I never heard the shots when he poached the buck. There are so many shots around us during deer season that it's impossible to determine what's on our land or not. I guess I'm used to the sound now, so unless I SEE a hunter cutting across my field or through my woods, obviously trying not to be seen, I just let it go. Buck on the first day of deer gun season. Most of the hunters I've had to go talk to have been very polite about leaving and apologetic about trespassing. Here in southeastern Ohio, with our old farms, thick woods, and rugged terrain, it's really hard to tell where the property lines are. So we exchange a few friendly words and I wish them luck as they trudge off in the right direction. If they shoot a deer and it runs onto our land before expiring, they know they can come get it. It's not my neighbors and the local hunters I'm concerned about. They know me and, more or less, where the property lines are. And most of them have their own places to hunt—they've probably been hunting them for years. It's the hunters "from away" that worry me. They may not know anyone living near where they are hunting, or where their houses are. And this may be the only weekend of the year that they are outside with a gun. I don't post my land against hunting because I am anti-hunting. I just feel like there should be some place where there isn't hunting during deer season. Seeing what the trespassing hunters have left for us over the years: rotting deer carcasses, gut piles, Skoal cans, Gatorade bottles full of human urine, beer cans, and hundreds of plastic and metal shotgun shell casings, I'm not sorry that my land is off-limits. Still alive two minutes later. Hunting is not actually legal until an hour before dawn--about 5 am. That's life in the country, babe. It's not all cute baby bluebirds and amber waves of grain. There are times when you are tested by the circumstances of living in a rural setting. Then again, I've lived in some of the largest cities in the world, and I still choose to live here in the back of beyond. Blue jay, dark-eyed junco, northern cardinal on a snowy afternoon. In winter, when we feed suet dough to our backyard birds, we often see a number of hungry individuals waiting for their turn to eat. I did not realize this fully until I started taking pictures of the suet dough visitors on our back deck railing. This series of images, like many other similar shots I've shared here recently, was taken with a Wingscapes BirdCam. I think it's pretty interesting how the birds line up along the deck railing. There were a number of neat combinations of birds in the images the camera captured—I'm only sharing a handful here. 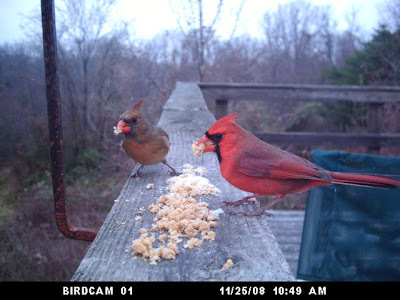 Cardinals at the suet dough. Junco (head only) and three cardinals. We're out of food. Ever see those old couples in restaurants eating unhappily and saying NOTHING to each other? 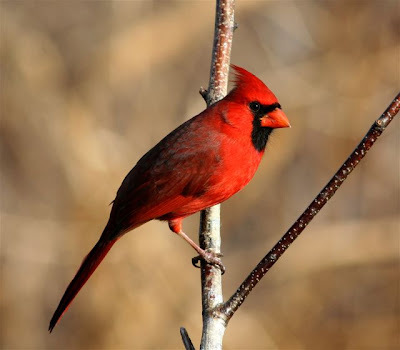 Cardinals are always the last birds at the feeder at the end of the day.